Background/Aims To investigate whether intravitreal injection of triamcinolone acetonide (IVTA) combined with vitrectomy prevents postoperative inflammation in patients with vitreous haemorrhage (VH) due to proliferative diabetic retinopathy (PDR). Methods This prospective, multicentre, randomised study conducted at seven sites in Japan enrolled patients diagnosed as having VH following PDR. Patients underwent vitrectomy with (IVTA+VIT group) or without (VIT group) IVTA at the end of the surgery. Anterior flare intensity (AFI), central retinal thickness (CRT), best-corrected visual acuity (BCVA) and intraocular pressure (IOP) were measured before and at 3 days, 1 week, 1, 3 and 6 months after surgery and compared. Results Number of patients who completed 6 months of follow-up was 40 and 41 in VIT group and IVTA+VIT group, respectively. AFI was significantly higher in the VIT group than in the IVTA+VIT group at 3 days (P=0.033), 1 week (P=0.019) and 1 month (P=0.037). There were no significant differences in CRT, BCVA and IOP between the groups through the observational periods. In the cases with macular oedema >350 µm of CRT at 3 days, CRT was significantly lower in the IVTA+VIT group than in the VIT group at 1 month (P=0.041). Conclusions IVTA combined with vitrectomy and cataract surgery contributed to inhibit the postoperative inflammation in patients with VH due to PDR. The effect of IVTA in the reduction of diabetic macular oedema may be limited to the early stage after surgery. Trial registration number UMIN000020376, Post-results. Proliferative diabetic retinopathy (PDR) is one of the leading causes of blindness in the working population.1 PDR is characterised by retinal ischaemia and neovascularisation, which leads to vitreous haemorrhage (VH) and tractional retinal detachment. VH causes sudden visual loss and also interferes with panretinal photocoagulation (PRP). Pars plana vitrectomy (PPV) can be very effective in the treatment of PDR by removing vitreous opacity, relieving retinal traction and performing PRP. With advances in technology, microincision vitrectomy surgery (MIVS) with 23-gauge, 25-gauge and 27-gauge PPV systems has become the standard in clinical practice.2 3 Compared with non-microincision 20-gauge vitrectomy, MIVS is less invasive, has less postoperative inflammation, leads to faster recovery and reduces patient discomfort.4 5 Nevertheless, several ocular complications, such as enhancement of cell flare intensity, fibrovascular proliferation and iris synechia, are still encountered.6 Therefore, it is important to prevent postoperative inflammation after vitrectomy. Corticosteroids have traditionally been used to treat inflammation because of their ability to reduce leucocyte migration and cytokine production and to antagonise the action of vascular endothelial growth factor (VEGF).7 8 The effect of three potent synthetic corticosteroids, that is, triamcinolone acetonide (TA), dexamethasone and fluocinolone acetonide, was investigated as a treatment for diabetic macular oedema (DME). In Japan, only intravitreal injection of TA (IVTA) has been clinically approved, and several studies have demonstrated the efficacy of IVTA for improving macular swelling. Moreover, TA improves the visibility of the hyaloid and safety of surgical procedures, and the posterior vitreous detachment induced by IVTA is currently a standard technique used in vitrectomy.9 Although the TA injected to visualise the vitreous is removed during surgery, IVTA may contribute to reduction of postoperative inflammation and macular swelling. In this prospective, multicentre, randomised study, we investigated whether additional IVTA is effective for reducing postoperative inflammation and macular swelling in the eyes of patients with VH and diabetes mellitus (DM). This study was conducted at seven clinical centres throughout Japan. The study protocol was approved by the institutional review board of each clinical centre, and adhered to the tenets of the Declaration of Helsinki. The protocol and the safety and efficacy implications of the interventions were explained to all participants before enrolment. All patients provided informed consent. This study was registered with the University Hospital Medical Information Network Clinical Trials Registry (UMIN) of Japan (ID UMIN 000020376; date of access and registration, 28 December 2015). Patients with type 2 diabetes who required vitrectomy for VH were eligible for this study. Preoperatively, at 3 days, 1 week, 1, 3 and 6 months after surgery, all patients underwent a complete ophthalmic examination, including best-corrected visual acuity (BCVA), Goldman application tonometry, fundus examination, laser flare meter and optical coherence tomography (OCT) (SPECTRALIS: Heidelberg Engineering, Vista, California, USA). BCVA was converted to the logarithm of the minimum angle of resolution scale. The major exclusion criteria included: (1) history of injection of anti-VEGF drugs and steroids and retinal photocoagulation within 3 months before surgery, (2) active intraocular inflammation or infection in either eye, (3) uncontrolled glaucoma in either eye, (4) retinal detachment, (5) history of stroke and (6) systolic blood pressure (BP) >160 mm Hg or diastolic BP >100 mm Hg or untreated hypertension. Patients were randomised at a 1:1 allocation ratio to either vitrectomy treatment (the VIT group) or combination treatment with vitrectomy followed by IVTA (the VIT+IVTA group) by the covariate adaptive randomisation. The research investigator was not involved in the process of randomisation. Although the patients and study physicians were not blinded to the therapeutic modality, the OCT technician and all statisticians were blinded to the randomisation of patients. After local anaesthesia by a sub-Tenon capsule injection of lidocaine hydrochloride, a standard four-port PPV was performed by using 25-gauge microincision procedures with chandelier illumination (Constellation Vision System; Alcon, Irvine, California, USA). All patients basically underwent the same procedure except for the treatment of IVTA at the end of the surgery. During the vitrectomy, all patients received photocoagulation using a laser system (Purepoint, 532 nm), which was equipped with the Constellation Vision System (Alcon). We applied PRP burns around the retinal vascular arcade as far peripheral as just anterior to ora serrata. The laser power setting was 120–160 mW, the duration was 0.2 s, and the interval was 0.2 s. The laser power was set strong enough to cause a white spot to appear on the retina. MaQaid (40 mg/phial) was purchased from Wakamoto Pharmaceutical (Tokyo, Japan). MaQaid was dissolved in 1 mL Balanced Salt Solution Plus (Alcon Laboratories, Fort Worth, Texas, USA), and 0.2 mL of the solution was separated and kept in a 1 mL syringe. In the IVTA+VIT group, 0.1 mL (4 mg) was injected into the vitreous cavity through a 30-gauge needle at the end of the surgery. The remaining solution (0.8 mL) was diluted fourfold to achieve a final concentration of 10 mg/mL to visualise the vitreous body during the surgical procedure, and the vitreous membrane, including the posterior hyaloid portion, were completely removed. Phakic patients also underwent phacoemulsification and implantation of the intraocular lens (IOL) via a foldable IOL with a round 7.0 mm (Eternity NX-70; Santen, Osaka, Japan) prior to the vitrectomy but only on patients who were >50 years old and had a cataract that prevented a clear view of the retina during surgery. Postoperatively, all patients received similar routine medications, bromfenac sodium two times per day, betamethasone and levofloxacin three times per day for 3 months. If the epiretinal membrane (ERM) was present, that was removed during surgery. Also, if DME was noticed during vitrectomy, the internal limiting membrane (ILM) peeling were carried out with the aid of the staining using 0.025% Brilliant Blue G (ILM Blue, DORC, Zuidland, The Netherlands). A laser flare cell photometer (FM-600 or FM-700; Kowa, Nagoya, Japan) was used to quantify the degree of aqueous flare and cells according to the manufacturer’s protocol. Laser cell measurements were performed preoperatively and at 3 days, 1 week, 1, 3 and 6 months postoperatively. Measurements were taken 30 min after the application of 0.5% tropicamide and 0.5% phenylephrine hydrochloride (Mydrin P, Santen), repeated 10 times, and then averaged to obtain final results for flare intensity. Central retinal thickness (CRT) was measured by using OCT map mode 3 days, 1 week, 1, 3 and 6 months after vitrectomy. A sample size of 38 subjects in each group would have provided 80% power to show, at a two-sided α-level of 0.05 and an effect size of 0.8, the superiority of the combination therapy with IVTA compared with VIT monotherapy. The significance of differences in age, duration of DM and level of haemoglobin A1c between the two study groups was analysed using an unpaired t-test. The significance of the differences in flare intensity, intraocular pressure (IOP), CRT and BCVA was analysed by using the Mann-Whitney U test. Bartlett’s test was used to examine the equal variances across samples. After inspecting the normal distribution of the data, CRT, flare values, IOP or BCVA among the different time points were compared by using the Wilcoxon signed-rank test. Differences with P<0.05 were considered as indicating statistical significance. The data were presented as the mean±SE. Eighty-four eyes of 84 patients were examined in this study between 3 April 2016 and 31 January 2017. Forty-two patients were randomised to the VIT+IVTA group and 42 to the VIT group. During the vitrectomy, the fibrovascular tissue was noticed in 13 (31%) and 15 (36%) cases of VIT group and VIT+IVTA group, respectively. Tractional retinal detachment was complicated in two cases of the VIT group, and gas or silicon oil tamponade was performed. These cases were excluded from this study (figure 1). Additionally, one patient in the VIT+IVTA group exited the study because his last visit was at 1 month after surgery, so the required follow-up at 6 months could not be performed. Thus, the resultant numbers of patients who completed 6 months of follow-up were 40 and 41 in the VIT group and IVTA+VIT group, respectively (figure 1). Table 1 shows the baseline characteristics at registration for the two groups. There were no significant differences in the general medical history or ophthalmological factors between the two groups. Table 2 shows the data of surgical parameters, including the combination of cataract surgery, removal of fibrovascular tissue and ERM, ILM peeling, number of laser shots and the surgical time. No significant difference in these parameters was found between the groups. Diagram showing the study design. Eligible eyes were randomised 1:1 to receive a vitrectomy with or without intravitreal injection of triamcinolone acetonide (IVTA). We compared the temporal profiles of CRT, BCVA, IOP and anterior flare intensity (AFI) between the IVTA+VIT group and VIT group (figures 2 and 3). AFI dramatically increased at day 3 in both groups, then gradually decreased. The AFI was significantly lower in the IVTA+VIT group than in the VIT group at day 3 (P=0.033), 1 week (P=0.019) and 1 month (P=0.037) (figure 2A). Since cataract surgery might influence on the anterior inflammation, we separately analysed the changes of AFI in the eyes underwent vitrectomy with or without cataract surgery. 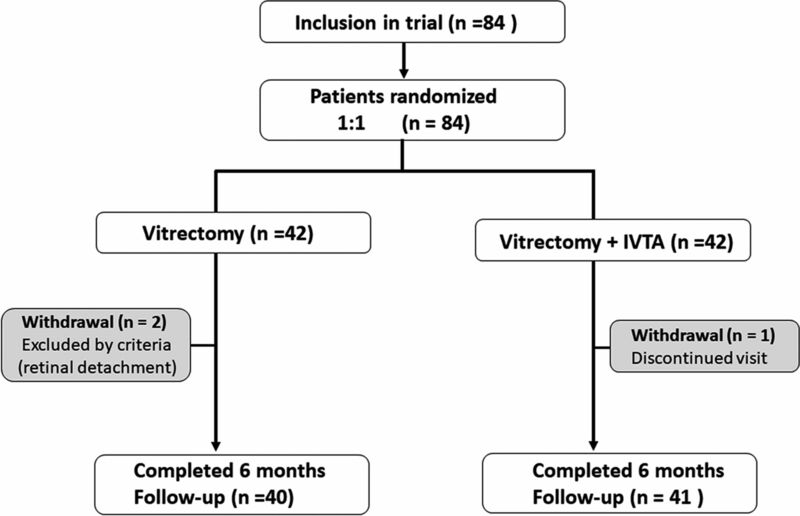 Similar to the results of all cases, AFI in the IVTA+VIT group was significantly lower than that of VIT group at day 3 (P=0.026), 1 week (P=0.012) and 1 month (P=0.021) in the patients underwent vitrectomy combined with cataract surgery (figure 2B). In the eyes underwent vitrectomy, significant difference was also found at day 3 (P=0.031), 1 week (P=0.018) and 1 month (P=0.015) postoperatively (figure 2C). In the values of CRT (figure 3A), BCVA (figure 3B) and IOP (figure 3C), no significant differences were found between the groups at any time points. In both groups, BCVA dramatically improved at day 3 and thereafter postoperatively, and the final BCVA values were 0.195±0.048 and 0.251±0.059 in the VIT group and IVTA+VIT group, respectively. Changes in the intensity of flare in the eyes of the patients who underwent vitrectomy (VIT group) or vitrectomy combined with intravitreal triamcinolone acetonide (IVTA) (VIT+IVTA group). (A) All cases, (B) cases of vitrectomy combined with cataract surgery, (C) cases of vitrectomy. Data are presented as the mean+SE. *P<0.05 (VIT group vs IVTA+VIT group). D, day; M, month; PC, photon count; W, week. Changes in the intensity of central retinal thickness (A), best-corrected visual acuity (B) and intraocular pressure (C) in the eyes of the patients who underwent vitrectomy (VIT group) or vitrectomy combined with intravitreal injection of triamcinolone acetonide (IVTA) (VIT+IVTA group). Data are presented as the mean+SE. D, day; M, month; W, week. The number of laser shots was significantly correlated with AFI at 1 week (P=0.024, R2=0.162) in the VIT group (figure 4A). On the other hand, the relationship between the number of laser spots and the flare intensity was insignificant in the IVTA+VIT group (figure 4B). There was no significant correlation between the surgical time and AFI at any time point in each group. 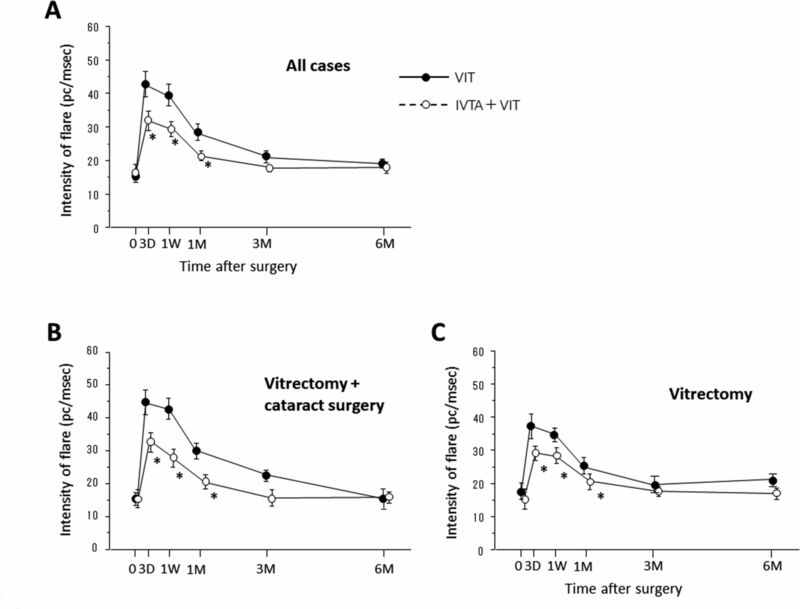 Relationship between the anterior flare intensity at 1 week after surgery and the number of photocoagulations in the vitrectomy (VIT) group (A) and intravitreal injection of triamcinolone acetonide (IVTA) +VIT group (B). There was a significant correlation in the VIT group (A; P=0.024, R2=0.162) but not in the IVTA+VIT group (P=0.221). PC, photon count; . We investigated whether additional IVTA could reduce the CRT in the patients with significant macular oedema. In this study, the measurement of CRT was initiated from day 3 after surgery because VH disturbed the OCT measurement before surgery. The average CRT values at 3 days after surgery were 328±19 µm and 330±14 µm in the VIT group and VIT+IVTA group, respectively. The percentages of the patients with macular oedema >350 µm measured at day 3 were 42.5% (17/40) and 43.9% (18/41) in the VIT group and VIT+IVTA group, respectively. All patients who underwent the removal of ERM (nine cases in VIT group, seven cases in IVTA+VIT group) were included these macular oedema group. Also, in these macular oedema subgroup, most of patients, 94.4% (17/18) in the IVTA +VIT group and 94.1% (16/17) in the VIT group, underwent ILM peeling during vitrectomy. We focused on these patients with DME and performed a subanalysis of the effect of the combination of IVTA (figure 5A). In both groups, CRT gradually decreased, and the difference from baseline became significant at 6 months after surgery. The CRT was significantly lower in the IVTA+VIT group than in the VIT group at 1 month (P=0.038). In both groups, acute improvement of BCVA were observed after surgery. 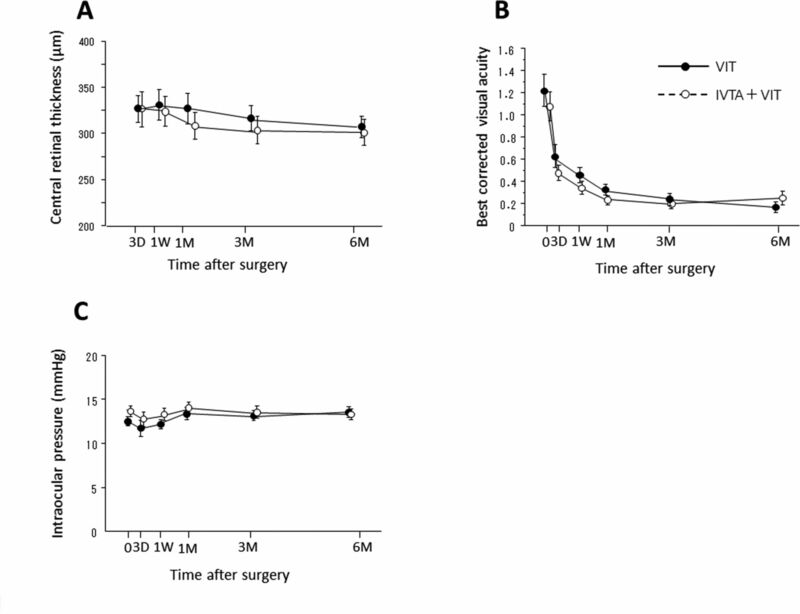 Even if DME was present, BCVA was improved from 1.17±0.21 to 0.47±0.08 in the VIT group, and from 1.12±0.24 to 0.36±0.07 in the IVTA+VIT group during 1 month after surgery. The final BCVA values at 6 months were 0.274±0.088 and 0.372±0.076 in the VIT group and IVTA+VIT group, respectively. No significant difference in visual acuity was found between the groups (figure 5B). The changes in central retinal thickness (CRT) (A) and visual acuity (B) in the VIT group and intravitreal injection of triamcinolone acetonide (IVTA)+VIT group in the patients with significant macular oedema. Data represent the mean±SE. *P<0.05 (VIT group vs IVTA+VIT group). #P<0.05 (compared with CRT at 3 days after vitrectomy). D, day; logMAR, logarithm of the minimum angle of resolution; M, month; W, week. Recurrent VH occurred after surgery in 3 (7.1%) and 2 (4.8%) cases of VIT group and VIT+IVTA group, respectively. The difference of the ratio was insignificant between the groups (χ2 test). Reoperation of vitrectomy was carried out in one case of the VIT group at 5 months after initial surgery, and in the other cases, VH was absorbed spontaneously. The onsets of retinal detachment and endophthalmitis were not observed in both groups through the observational periods. Inflammation is a non-specific response to surgical invasion and laser photocoagulation. After cataract surgery and laser procedures, intraocular levels of proinflammatory cytokines are upregulated, which leads to worsening of DME.10–13 It has been reported that combination therapy of IVTA with cataract surgery or photocoagulation effectively reduced inflammation and related ocular complications.14–17 Similar to those findings, our results demonstrated that the flare intensity after surgery in the eyes combined with IVTA was significantly lower than that of vitrectomy only. These results suggest that IVTA can also effectively reduce the inflammation induced by surgical invasion and photocoagulation. Our data also showed that the AFI in IVTA+VIT group was significantly lower compared with that in VIT group in both cases of vitrectomy combined with and without cataract surgery. Thus, regardless of having the combination of cataract surgery or not, the additional treatment of IVTA with vitrectomy may be effective option to inhibit the postoperative inflammation. To reduce the risks of onset or progression of neovascularisation and rubeotic glaucoma, photocoagulation is routinely performed in the ischaemic area of the peripheral retina during vitrectomy. However, laser photocoagulation may be an important factor in the postoperative anterior inflammation.11 18 19 Actually, our data showed that there was a positive correlation between the number of laser shots and AFI in the VIT group. In contrast, this significant relationship was not observed in the IVTA+VIT group, which indicated that IVTA potentially could inhibit inflammation after surgery even if the number of laser spots was relatively greater. It is recognised that thermal burns induce transient elevation of inflammatory cytokines in the vitreous or aqueous humour, which indicates induction of inflammation.12 20 We recently showed that IVTA combined with PRP in the eyes of pigmented rabbit suppressed both the expression of VEGF and of proinflammatory cytokines, whereas bevacizumab, an anti-VEGF drug, prevented VEGF only.18 These findings suggest that TA acts as a multipotency agent with anti-inflammatory and VEGF expression inhibitory properties. The inhibitory effect of AFI by the combination therapy of IVTA may be related to the reduction of cytokine levels after vitrectomy with photocoagulation. This may be supported by the report that the AFI was significantly correlated with the levels of inflammatory cytokines in the vitreous fluid of the eyes with DME.21 In addition to the inflammation induced by cytokines, disruption of blood ocular barrier may also be largely involved in the pathology of the enhancement of AFI. Steroid treatment may have a potential to protect the disruption of blood ocular barrier in patients with PDR. Several clinical trials have demonstrated that IVTA effectively reduced CRT in DME of both vitrectomised and non-vitrectomised eyes.20 22 We were interested in determining whether the combination of IVTA with vitrectomy contributes to reduction of DME postoperatively. Based on all of our data, no significant differences were found between the two groups. This finding may be because approximately 60% of the patients in each group had little macular swelling, and the normal ranges of CRT will not show further thinning or anatomical improvement after surgery. Thus, we focused on the patients with DME who exhibited >350 µm in CRT at 3 days postoperatively. Limited to this patient series, CRT was significantly lower in the IVTA+VIT group than in the VIT group at 1 month after surgery. We speculate that additional IVTA could potentially accelerate improvement of DME, though the effect was limited in the early period after vitrectomy. Within the subgroup of macular oedema, the patients who underwent ERM or ILM peeling were equally distributed in IVTA+VIT group and VIT group. Although ERM or ILM peeling may have positive effect in reducing CRT, it is unlikely that these additional procedures resulted in the large differences in the postoperative changes of CRT between the groups. The pharmacological effect of IVTA is time limited, and the intravitreal concentration of TA is detectable up to 2.75 months after a single 4 mg injection in non-vitrectomised human eyes.23 TA may be washed out faster in vitrectomised eyes than in non-vitrectomised eyes.24 However, a clinical report by Watanabe et al did not find a significant difference in the efficacy to reduce macular thickness after IVTA between vitrectomised and non-vitrectomised eyes, which indicated that IVTA may be a valid treatment option for DME even in vitrectomised eyes.20 Even if TA is washed out relatively faster, it may be sufficient to inhibit the inflammation induced in the early stage after surgery. Corticosteroids, either topically or systemically administered, have a risk of IOP elevation. However, our results showed that the addition of IVTA did not affect IOP postoperatively, and no eye showed uncontrollable IOP elevation. The reason remains unclear, however, it is possible that the increased clearance of TA by removal of the vitreous also reduces the risk of steroid-related complications, such as IOP elevation. Actually, Beer et al reported that the half-life of TA in the aqueous humour was 18.6 days in the non-vitrectomised eyes, whereas it was only 3.2 days in the vitrectomised eyes.25 Cataract formation is the other main ocular complication induced by IVTA. In our study, the IVTA+VIT group included no case of lens-sparing vitrectomy. However, if the cases of lens-sparing vitrectomy were encountered, we should pay attention for the risks of the progression of cataract which may be induced by IVTA postoperatively. In our patient series, onset of endophthalmitis, retinal detachment or other complications with IVTA were observed. Also, it is unlikely that IVTA affects the incidence of recurrent VH after surgery. However, further large-scale studies are necessary to evaluate the safety of combination therapy with IVTA. We have a limitation that should be considered. We enrolled patients with PDR and VH, and thus, we could not determine the CRT before vitrectomy and how the CRT changed during the 3 days after surgery. To resolve this problem, participants should be selected more strictly by limiting selection to participants with DME without VH. In conclusion, we studied the effects of IVTA on AFI and CRT after vitrectomy and cataract surgery for PDR. The combination of IVTA with vitrectomy may contribute to the reduction of CRT, however, the effect seems to be limited in the early stage after surgery. On the basis of our data, we recommend that IVTA should be administered at the end of vitrectomy and cataract surgery to achieve less inflammation for PDR with VH in the early stage after surgery. Other members in this study included Masaru Takeuchi (Department of Ophthalmology, National Defense Medical College, Tokorozawa, Saitama, Japan), Masumi Wakabayashi, Toshinori Murata (Department of Ophthalmology, Shinshu University School of Medicine, Matsumoto, Nagano, Japan), Yutaka Yamada and Masakazu Morioka (Department of Ophthalmology, Faculty of Medical Science, University of Fukui, Yoshida, Fukui, Japan).
. Management of proliferative diabetic retinopathy. Compr Ophthalmol Update 2007;8:245–56. Contributors YT: conception or design of the work, data collection, data analysis and interpretation, drafting the article, critical revision of the article. MShi: data collection. TK: data collection. HS: data collection. MSu: data collection. TH: data collection. TS: conception or design of the work. MG: data collection. TM: data analysis and interpretation. MI: data analysis and interpretation. Funding Publication of this article was supported in part by grants-in-aid for scientific research (number 24592620) from the Japan Society for the Promotion of Science, Tokyo, Japan. Ethics approval The University of Fukui Institutional Review Board. Collaborators Japan-Clinical Retina Research Team (J-CREST).